This is a novel about people who aspire to live the rich and beautiful life, and what can go wrong when one of them tries to change the rules. Sarah Bowler is part of the inside world of the well-to-do upper crust of cosmopolitan New York City—she lives on Fifth Avenue, her children go to private schools, and they all travel on Fridays to Long Island. Their world is one of good taste, education, grace, and breeding. But Sarah Bowler longs for riches of another sort. Attracted to the world of international art, she takes a job in a Madison Avenue art gallery. And then suddenly she finds herself caught in a net of conflicting ambitions, and divided between two worlds, as she discovers the cracks beneath the surface of each. This is a stunning novel, set against the background of New York's fine life and art circles, about people with great expectations, and what happens to one woman when she tries to realize hers. 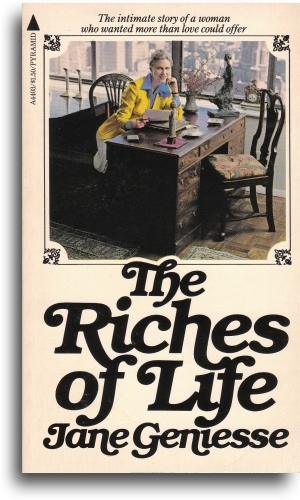 From the 1976 dust jacket cover: Jane Geniesse grew up in Cambridge, Massachusetts, and attended Radcliffe College and the Columbia School of Journalism. A sometime painter herself, she was a contributing editor at Architectural Digest. Her articles have appeared in New York magazine, the New York Times Magazine, and other publications. She lives in New York with her husband and two children.